Good morning and God’s blessings to all, including all the mothers in the congregation, with our best wishes to you on this Mothers’ Day Sunday. Today’s lesson entitled: ‘Mary: Mother of Jesus and Disciple of Christ’, we will examine the influence of an extraordinary woman, who is well known as the mother of Jesus, the Son of God. However, sadly, scholars generally have not acknowledged Mary’s dedicated discipleship to Jesus, the Messiah. I remember each time Sophie became pregnant with each of our four children, she would call me at work to share with me the happy news. 35 And the angel answered her, “The Holy Spirit will come upon you, and the power of the Most High will overshadow you; therefore the child to be born[d] will be called holy—the Son of God. Mary did not demonstrate an overt emotional reaction to the news that she was chosen to be the mother to the Christ, a Messiah that the Jews had waited for over eight hundred years since his birth was first prophesized. Over the next few years, following the birth of Jesus, the family of Jesus would be visited by a host of angels, three Magi, and be forced to flee for their lives to Egypt. 41 Now his parents went to Jerusalem every year at the Feast of the Passover. 42 And when he was twelve years old, they went up according to custom. 43 And when the feast was ended, as they were returning, the boy Jesus stayed behind in Jerusalem. His parents did not know it, 44 but supposing him to be in the group they went a day’s journey, but then they began to search for him among their relatives and acquaintances, 45 and when they did not find him, they returned to Jerusalem, searching for him. 46 After three days they found him in the temple, sitting among the teachers, listening to them and asking them questions. 47 And all who heard him were amazed at his understanding and his answers. 48 And when his parents[a] saw him, they were astonished. And his mother said to him, “Son, why have you treated us so? Behold, your father and I have been searching for you in great distress.” 49 And he said to them, “Why were you looking for me? Did you not know that I must be in my Father’s house?”[b] 50 And they did not understand the saying that he spoke to them. 51 And he went down with them and came to Nazareth and was submissive to them. And his mother treasured up all these things in her heart. 48 And when his parents saw him, they were astonished. And his mother said to him, “Son, why have you treated us so? Behold, your father and I have been searching for you in great distress.” 49 And he said to them, “Why were you looking for me? Did you not know that I must be in my Father’s house?” 50 And they did not understand the saying that he spoke to them. While not making excuses for Mary and Joseph for being separated from Jesus, as we shall see later in the lesson, it is recorded that Jesus was not their only child. The Scriptures indicate Jesus had at least six siblings, four brothers and at least two sisters, (Mark 6:1-6). 51And he went down with them and came to Nazareth and was submissive to them. As she had done after her son’s birth, Mary treasured all these things in her heart. And though Jesus was raised to honour his parents, he obviously was instructed well with regard to the Scriptures, as he had demonstrated in the temple in Jerusalem. It should be pointed out that in Luke 2, Verse 49, that Jesus indicated more than an academic knowledge of the Scriptures when he spoke to his parents, 49 And he said to them, “Why were you looking for me? Did you not know that I must be in my Father’s house?”, which reveals an awareness of the identity of his Father, as the temple where he was found is considered to be the house of God. Verse 50 of Luke 2 indicates an understanding of his Father’s identity that came from God, and not from Mary nor Joseph as his parents initially understand the meaning of their son’s words, 50 And they did not understand the saying that he spoke to them. This passage in Acts is the last place in the Scriptures to mention Mary’s husband Joseph, who is absent from future gospel accounts of the disciples. I believe that Joseph had passed, as we will see later in our lesson, when Jesus spoke at Nazareth, some present recognized him as Jesus the carpenter and as the son of Mary. Joseph is not mentioned at all (Mark 6:1-6). We see that Mary was more than a mother traveling with her son, she was traveling with Jesus and his disciples, as a disciple of Christ. And isn’t it just like a mother to ask her son to help provide the host of the wedding with wine. You will note that though Jesus had begun his ministry, that at this time he and his disciples accompanied his mother to a wedding. This indicates the human side of Jesus, who on more than one occasion honored his mother, by referring to himself as the “son of man” rather than the “Son of God”. And not to disparage his Father, we see later that Christ honored his Godly side by chasing out the money changers from the temple, his Father’s house. 6 He went away from there and came to his hometown, and his disciples followed him. 2 And on the Sabbath he began to teach in the synagogue, and many who heard him were astonished, saying, “Where did this man get these things? What is the wisdom given to him? How are such mighty works done by his hands? 3 Is not this the carpenter, the son of Mary and brother of James and Joses and Judas and Simon? And are not his sisters here with us?” And they took offense at him.4 And Jesus said to them, “A prophet is not without honor, except in his hometown and among his relatives and in his own household.” 5 And he could do no mighty work there, except that he laid his hands on a few sick people and healed them. 6 And he marveled because of their unbelief. In addition to their astonishment to Jesus wisdom and to the miracles that the Lord had performed, the people identified Jesus as a carpenter, the son of Mary, having four brothers and at least two sisters. Since the sisters of Jesus are not named, we only know that there are at least two. And because the people make no mention of Joseph, we might infer that likely he has passed away. 4 And Jesus said to them, “A prophet is not without honor, except in his hometown and among his relatives and in his own household.” 5 And he could do no mighty work there, except that he laid his hands on a few sick people and healed them. 6 And he marveled because of their unbelief. 12 Then they returned to Jerusalem from the mount called Olivet, which is near Jerusalem, a Sabbath day’s journey away. 13 And when they had entered, they went up to the upper room, where they were staying, Peter and John and James and Andrew, Philip and Thomas, Bartholomew and Matthew, James the son of Alphaeus and Simon the Zealot and Judas the son of James. 14 All these with one accord were devoting themselves to prayer, together with the women and Mary the mother of Jesus, and his brothers and sisters. From the accounts of Jesus’ birth and of his visit as a child to the elders of the temple, Mary sought to give Jesus all her the love and dedication a son could ever expect, while maintaining both the faith and devotion expected to be given to Jesus, the Christ, as a disciple of the Lord. Her example of faith was followed by all of her children who assembled faithfully in the Upper Room, demonstrating how the faith of a mother can, by her example, teach an invaluable lesson of discipleship to her children. Closing Hymn #126: Amen, Amen! Last Wednesday, called by some Christian churches as Ash Wednesday, marks the beginning of Lent, which is a season of forty days, not counting Sundays, which begins on Ash Wednesday and ends on Holy Saturday. It interesting that the first day of Lent for 2018 happens to also fall on Saint Valentine’s Day, which occurred last in 1945, Lent comes from the Anglo Saxon word lencten, which means “spring.” The forty days represents the time Jesus spent in the wilderness, enduring the temptation of Satan and preparing to begin his ministry. For our lesson today, let us look at the significance to what happened during Lent and the days following. Much of today’s lesson is taken from the Book of Acts of the Apostles. We embark on a new chapter of the God’s Plan, where our Lord makes available a part of God or the Holy Trinity, which is the Holy Spirit, to all of humanity who call upon the name of the Lord; confess their sins; and decide to follow the Way of the Lord, being baptised in Holy Spirit. 13 But if there is no resurrection of the dead, then not even Christ has been raised. 14 And if Christ has not been raised, then our preaching is in vain and your faith is in vain. 15 We are even found to be misrepresenting God, because we testified about God that he raised Christ, whom he did not raise if it is true that the dead are not raised. 16 For if the dead are not raised, not even Christ has been raised. 17 And if Christ has not been raised, your faith is futile and you are still in your sins. 18 Then those also who have fallen asleep in Christ have perished. 19 If in Christ we have hope[a] in this life only, we are of all people most to be pitied. This passage points out that not only is the Resurrection of the Lord important critical proof that Jesus is Lord and the truth of the Gospel and allows us to be confident in God’s promises to forgive our sins, trust in the promise of the our own resurrection from death as well judgement and validates the truth of our sharing the Gospel of Jesus Christ, as a foundation of our faith and trust in the Lord. God’s Plan for our Salvation is through Jesus Christ. Those elements being how Jesus rode a young donkey into Jerusalem on Palm Sunday; Jesus’ washing of the feet of the 12 Disciples; the Last Supper of the Lord on the Passover; the Lord’s Crucifixion on Good Friday; the Resurrection on Easter Sunday; The Lord’s Ascension into Heaven and the Gift of the Spirit at Pentecost. Each element of Holy Week was foretold by God to the prophets and recorded in Scripture and is a necessary step in a ladder of events to fulfill God’s Salvation Plan. We even talked about the two prophets on the Emmaus Road, who encountered the resurrected Christ and brought the good news back to the remaining 11 disciples in the Upper Room in Jerusalem. What was this Upper Room referred to in the Scriptures? It is funny how we will often refer to the name of a place, not knowing where it is located or what its purpose was. I recall when I first dated Sophie and visited her house, which was often filled with the extended family: brothers, sisters, nieces, nephews and of course the notorious “last room.” If a visitor came and was offered a ginger ale or coke, the duty of retrieving the pop usually fell upon a young niece or nephew. Pop was usually kept in a place referred to as “The Last Room.” If something was needed or missing, such as an umbrella, a slipper, a shoe, a hat, a coat or a broom, the searcher would usually be directed to look in “The Last Room.” It was only after a month or so that I figured out that this “Last Room” was an enclosed porch at the back, north side of the house. The Last Room served as a combination cold room, cloak room, and broom closet. This porch was not insulated and had windows which opened to allow access to a clothesline which ran from the back wall of thr house to an ancient large pear tree in the backyard. If someone in the household was looking for a lost or missing item, the first and last place to look for it was usually the “Last Room”. Sadly, an addition to the house of a family room and washroom eliminated the notorious “last room” from the floor plan of the house, relegating the location to just a fond memory of the past. Most Bible scholars seem to agree that this Upper Room was the place where Jesus washed the feet of the 12 Disciples; where the Last Supper of Passover served by Jesus took place; where, later, the remaining 11 Disciples received the good news that the Lord had arose from the grave; where Thomas examined Jesus’ wounds from the crucifixion; where the Holy Spirit came upon the 120 believers, after Jesus ascended; and where Christ’s Church began.. But where and what was this place called the Upper Room or sometimes called the Upper Chamber? The Cenacle (from Latin cenaculum), also known as the Upper Room, is the site of The Last Supper. The word is a derivative of the Latin word cena, which means dinner. In Christian tradition, based on Acts 1:13,the “Upper Room” was not only the site of the Last Supper (i.e. the Cenacle), but the usual place where the Apostles stayed in Jerusalem, and following the arrival of the Holy Spirit on the Day of Pentecost and the arrival of”the first Christian Church”. The early history of the Cenacle site is uncertain; scholars have made attempts at establishing a chronology based on archaeological evidence and historical sources. The original building was a synagogue later probably used by Jewish Christians. According to the Catholic Encyclopedia, the building was spared during the destruction of Jerusalem under Titus (AD 70), though Pixner thinks it was likely rebuilt right after the war, and claims three walls of that structure are still extant: the North, East and South walls of the present King David’s Tomb. Roman emperor Theodosius I built an octagonal church (the “Theodosian Church” or “Holy Zion Church”) aside the synagogue (that was named “Church of the Apostles”). The Theodosian Church, probably started on 382 AD, was consecrated by John II, Bishop of Jerusalem on 394 AD. Some years later, c. 415 AD, Bishop John II enlarged the Holy Zion Church transforming it in a large rectangular basilica with five naves, always aside the Church of the Apostles. This building was later destroyed by Persian invaders in 614 AD and shortly after partially rebuilt by patriarch Modestus. In 1009 AD the church was razed to the ground by the Muslim caliph Al-Hakim and shortly after replaced by the Crusaders with a five aisled basilica named for “Saint Mary”, today the site of Dormition Abbey. It is thought that the Cenacle occupied a portion of two aisles on the right side of the altar. While the church was destroyed sometime after 1219, the Cenacle was spared. In the 1340s, it passed into the custody of the Franciscan Order of Friars, who maintained the structure until 1552, when the Ottoman Empire took possession of it. After the Franciscan friars’ eviction, this room was transformed into a mosque, as evidenced by the mihrab in the direction of Mecca and an Arabic inscription prohibiting public prayer at the site. Christians were not officially allowed to return until the establishment of the State of Israel in 1948. Note in verse 11 that Jesus was described as being taken up to heaven. Five times New Testament writers employ the Greek term analambano (to take up) of the Lord’s ascension (Mark 16:19; Acts 1:2,11,22; 1 Timothy 3:16). Each time the verb is in the passive voice, he “was taken up.” The passive voice represents the subject of the verb as being acted upon, thus, in this instance, indicating that the “taking up” was empowered from above, namely by God. This is almost comical as the disciples were asked, “Hey why are you looking up to heaven? Did Jesus not just tell you he would return in the same manner that he just left? Perhaps, it was the vision of our Lord’s ascension that had them transfixed. But remember that two had witnessed Jesus ascend on the day of the transfiguration. But that is another topic for another message. But it is important to note in verse 8, that teacher now passes upon the student, the disciples, the torch of teaching God’s Grace, with the power and help of the Holy Spirit. 51 While he blessed them, he parted from them and was carried up into heaven. 1And when the day of Pentecost was fully come, they were all with one accord in one place. 2 And suddenly there came a sound from heaven as of a rushing mighty wind, and it filled all the house where they were sitting. 3 And there appeared unto them cloven tongues like as of fire, and it sat upon each of them. 4 And they were all filled with the Holy Ghost, and began to speak with other tongues, as the Spirit gave them utterance. We have a good idea what the Upper Room was and the significance of events that occurred there. But what about the Pentecost event that took place in the Upper Room? Pentecost means Fifty. The Fiftieth is a prominent feast in the calendar of Ancient Israel celebrating the giving of the Law on Sinai, which coincides in the Christian liturgical year as the date commemorating the descent of the Holy Spirit upon the remaining eleven Apostles of Christ (Judas had hung himself), and over 100 others, a total of 120 Disciples in the Upper Room, after the Resurrection of Jesus. Thus, the day of Pentecost occurred some 50 days after Jesus was crucified and 10 days after our Lord’s Ascension into Heaven. So let us back up a bit to Christ’s Ascension, an event most scholars believe took place above the Mount of Olives, near Bethany. Beth anya which translates as “house of misery/Poor house?” Bethany is recorded in the New Testament as the home of the siblings Mary, Martha, and Lazarus, as well as that of Simon the Leper. Jesus is reported to have lodged there after his entry into Jerusalem, and it could be from Bethany that he parted from his disciples at the Ascension. We know that the Holy Spirit had been at work previously. We see him working through different people throughout the Old Testament. We see Jesus’ close connection with the Spirit in the Gospels. Now, though, something different was happening. According to what Jesus had told his disciples in Luke 24:49 (ESV), “And behold, I am sending the promise of my Father upon you. But stay in the city until you are clothed with power from on high” and what Peter said later in Acts 2:38 (ESV), “Repent and be baptized every one of you in the name of Jesus Christ for the forgiveness of your sins, and you will receive the gift of the Holy Spirit, the Spirit was working in a new manner, that is, in a way that he had not worked previously but in a way that had been promised or prophesied. So we conclude today’s lesson with a better understanding as the significance of the upper room as the location for the events of the teaching by our Lord by washing of the disciple’s feet, Jesus’ instruction to the disciples with regard to the elements of the Last Supper, the appearance of the Lord after the resurrection, the disciples’ selection of Matthias to replace the deceased Judas, the place where God’s gift of the Holy Spirit comes upon the men and women believers who prayed and waited there, and the location where Peter, having received the Spirit delivers the first sermon, and the place where 3,000 hear the Spirit-filled receive Christ as Lord and Saviour and are baptised in the Spirit. And with the Ascension of Jesus, we see the passing of the ministry of the Gospel of Christ to the body of believers, baptized with God’s power and comfort through the Holy Spirit. Benediction (2 Corinthians 13:14): The grace of the Lord Jesus Christ and the love of God and the fellowship of the Holy Spirit be with you all. Welcome to Bloor Lansdowne Christian Fellowship. Since today is Mother’s Day, I would like to share best wishes to all the mothers in the congregation this morning. I think of the many special things a mother may ponder in her heart with regards to the actions of their children. Although our younger children, Daniella and Jeffrey have their respective University and Secondary School graduations next month, I am reminded of our oldest child’s graduation ceremonies several years ago at the University of Guelph. Presiding over the Sashing Ceremonies for the graduates was Chancellor Lincoln Alexander, as you may know, had served as lawyer, parliamentarian, public servant, lieutenant-governor of Ontario. The sashing ceremony itinerary listed Athena’s group of Honors Bachelor of Science Degree graduates near the end of proceedings on a warm afternoon. I was impressed that Mr. Alexander did not hurry the proceedings, taking a few moments to exchange remarks with each graduate before the sashing. His conversation with our daughter brought a broad grin to Athena, lasting throughout the ceremony and even afterward. I wondered what special words of advice or wisdom were spoken to Athena by the Chancellor. When Athena walked to over to us, I asked her what Lincoln Alexander had said to her and Athena replied that Mr. Alexander had asked her: “Is your momma here today?” To which Athena replied, “Yes she is.” Then the Chancellor said, “Well give her a big smile, this is an important day for your momma!” Athena wore that smile for the remainder of the day, as Mr. Alexander’s comments were right on point. For our lesson today, I would like to examine Mary, the mother of Jesus, a special mother recorded in the Scriptures, including today’s scripture verses. These verses are listed in your bulletin, in their chronological order. Not only does Mary, who is betrothed or engaged to marry Joseph, find out that she will become pregnant, but she has been chosen by God, to be the mother of a holy child, the Son of God, whom she is to name “Jesus”. Luke 2:15-20 describes the visit to Bethlehem by shepherds of the field after they were informed by God’s angels of the birth of the Christ child. After the shepherds departed, Luke indicates that Mary treasured up or pondered these things in her heart. Our next Scripture passage gives us an idea of how Mary raised her son, Jesus, and the mother-son relationship Luke 2:41-51. And we read, again that Mary treasured up all these things in her heart. And though Jesus was raised to honour his parents, he obviously was instructed well with regard to the Scriptures, as he had demonstrated in the temple in Jerusalem. According to the Gospel of John (2:1-11), as Jesus was beginning his ministry, he and his disciples traveled with his mother, Mary, to a wedding at Cana in Galilee. The wedding host had run out of wine and Jesus’s mother came to him for help. At first, Jesus refused to intervene, but then he relented and asked a servant to bring him large jars filled with water. He turned the water into a wine of higher quality than any served during the wedding. John’s gospel depicts the event as the first sign of Jesus’s glory and his disciples’ belief in him. After the wedding, Jesus, his mother Mary and his disciples traveled to Jerusalem for Passover. At the temple, they saw moneychangers and merchants selling wares. In a rare display of anger, Jesus overturned the tables and, with a whip made of cords, drove them out, declaring that his Father’s house is not a house for merchants. We see that Mary was more than a mother travelling with her son; she was travelling with Jesus and his disciples. And isn’t it just like a mother to ask her son to help provide the host with wine. You will note that though Jesus had begun his ministry, that this time he and his disciples accompanied his mother to a wedding. This indicates the human side of Jesus, who on more than one occasion honored his mother, by referring to himself as the “son of man” rather than the “son of God”. And not to disparage his Father, Christ honored his Godly side by chasing the money changers from the temple. But being both the son of Mary and the Son of God did not confuse Jesus with respect to the importance of his ministry, as we see in Luke 11, verses 27-28. Jesus used the woman’s remark to emphasize that God’s blessings do not come by birthright, but by honoring and keeping the word of God. This statement is reinforced by Jesus’ remarks n Matthew 12:46-50. At first glance, it seems that Jesus disavowed his mother and siblings, indicating that the designation of a mother, brother or sister, in his view should apply only to those who do the will of the Father in heaven. 25 but standing by the cross of Jesus were his mother and his mother’s sister, Mary the wife of Clopas, and Mary Magdalene. 26 When Jesus saw his mother and the disciple whom he loved standing nearby, he said to his mother, “Woman, behold, your son!” 27 Then he said to the disciple, “Behold, your mother!” And from that hour the disciple took her to his own home. Just before giving up his spirit on the cross, Jesus saw his mother and John, who is referred to as the disciple who he loved. He then told Mary to behold her son, the disciple John. And to the disciple John, he said to behold your mother, Mary. Jesus was not talking about Mary as his birth mother. In accordance with what he had spoken to the people in Matthew 12:46-50, he was acknowledging the faith and discipleship of Mary. In this regard, Mary was his mother by birth and by Spirit. We have confirmation of this observation, when we read in the next Scripture verse, that Mary was again with the disciples in the Upper Room, after Jesus Ascended to heaven, obediently praying and awaiting the arrival of the promised Comforter, God’s Holy Spirit. Mary was special, not only because God had chosen her to give birth, and to raise His only Son; unlike most woman of the day, Mary choose not to stay at home and maintain a household. We see Mary as a loving, caring parent and as a disciple of faith and obedience, to the Father in heaven. The Scripture’s account of Mary’s journeys with Jesus and the disciples indicate how she was involved with the first miracle where Jesus turned water to wine and her presence at Jesus’ cleansing of the temple of the merchants and money changers. Mary continued to follow Jesus and demonstrated both her love for her son and obedience to her God. Mary understood that she had been favored by God to be the mother of God’s Son, Jesus, and was present at many of the important events in the life and ministry of her son. Mary was present at his birth, his death; witness to his resurrection; and present in the Upper Room on the day of Pentecost when God’s Holy Spirit came upon the disciples and believers that Jesus was the Messiah, the Christ, the true Son of God. To Jesus, Mary was his mother, not just because she gave birth to him, but as an obedient woman of faith who heard God’s word and kept it. Mary is an example to Christians, both as a loving parent and follower of God’s word, by taking care of Jesus, the son of man, who was also the Son of God. Much of today’s Message is taken from the Book of Acts of the Apostles. We embark on a new chapter of the God’s Plan, where our Lord makes available a part of God, the Holy Spirit to all of humanity who call upon the name of the Lord; confess their sins; and decide to follow the Way of the Lord, being baptised in Holy Spirit. This passage points out that not only is the Resurrection of the Lord important critical proof that Jesus is Lord and the truth of the Gospel and allows us to be confident in God’s promises to forgive our sins, trust in the promise of the our own resurrection from death as well judgement and validates the truth of our giving witness of the Gospel of Jesus Christ, as a foundation of our faith and trust in the Lord. Last Sunday’s service, we reviewed the events of Holy Week and how each event was a significant element of God’s Plan for our Salvation through Jesus Christ. Those elements being how Jesus rode a young donkey into Jerusalem on Palm Sunday; Jesus’ washing of the feet of the 12 Disciples; the Last Supper of the Lord on the Passover; the Lord’s Crucifixion on Good Friday; the Resurrection on Easter Sunday; The Lord’s Ascension into Heaven and the Gift of the Spirit at Pentecost. Each element of Holy Week was foretold by God to the prophets and recorded in Scripture and is a necessary step in a ladder of events to fulfill God’s Salvation Plan. We even talked about the two prophets on the Emmaus Road, who encountered the resurrected Christ and brought the good news back to the remaining 11 disciples in the Upper Room in Jerusalem. What was this Upper Room referred to in the Scriptures? Most Bible scholars seem to agree that this Upper Room was the place where Jesus washed the feet of the 12 Disciples; where the Last Supper of Passover served by Jesus took place; where, later, the remaining 11 Disciples received the good news that the Lord had arose from the grave; where Thomas examined Jesus’ wounds from the crucifixion; and where the Holy Spirit came upon the 120 believers, after Jesus ascended. But where and what was this place called the “Upper Room” or sometimes called the Upper Chamber? The Cenacle (from Latin cenaculum), also known as the “Upper Room”, is the site of The Last Supper. The word is a derivative of the Latin word cena, which means dinner. In Christian tradition, based on Acts 1:13, the “Upper Room” was not only the site of the Last Supper (i.e. the Cenacle), but the usual place where the Apostles stayed in Jerusalem, and according to the Catholic Encyclopedia “the first Christian church”. The early history of the Cenacle site is uncertain; scholars have made attempts at establishing a chronology based on archaeological evidence and historical sources. Biblical archaeologist Bargil Pixner offers these significant dates and events in the building’s history. So Jesus instructed the disciples to wait upon the Lord, as we read in Acts 1:4. Acts 1:4 – On one occasion, while he was eating with them, he gave them this command: “Do not leave Jerusalem, but (WAIT) for the gift my Father promised, which you have heard me speak about. When they returned to the Upper Room after Christ’s Ascension, the disciples numbered some 120, did not sit idly by, but began selected a replacement for Judas and continued in fervent prayer to prepare themselves for God’s gift. The blessing that Jesus gave, Luke 24:51, is often interpreted as a priestly act where Jesus leaves his disciples in the care of God the Father. The return to Jerusalem after the Ascension ends the Gospel of Luke where it began, in Jerusalem. And where in Jerusalem did the disciples go? The Upper Room! And in this Upper Room, the promised gift from God, the Holy Spirit was given to those who had gathered and prayed. 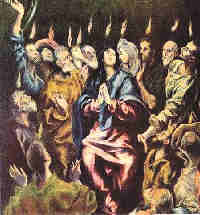 Acts 2:1-4 – And when the day of Pentecost was fully come, they were all with one accord in one place. 2 And suddenly there came a sound from heaven as of a rushing mighty wind, and it filled all the house where they were sitting. 3 And there appeared unto them cloven tongues like as of fire, and it sat upon each of them. 4 And they were all filled with the Holy Ghost, and began to speak with other tongues, as the Spirit gave them utterance. Now we have a good idea what the Upper Room was and the significance of events that occurred there. But what about the Pentecost event that took place in the Upper Room? So let us back up a bit to Christ’s Ascension, an event most scholars believe took place above the Mount of Olives, near Bethany. Beth anya, “house of misery/Poor house?”) is recorded in the New Testament as the home of the siblings Mary, Martha, and Lazarus, as well as that of Simon the Leper. Jesus is reported to have lodged there after his entry into Jerusalem, and it could be from Bethany that he parted from his disciples at the Ascension. 36 As they were talking about these things, Jesus himself stood among them, and said to them, “Peace to you!” 37 But they were startled and frightened and thought they saw a spirit. 38 And he said to them, “Why are you troubled, and why do doubts arise in your hearts? 39 See my hands and my feet, that it is I myself. Touch me, and see. For a spirit does not have flesh and bones as you see that I have.” 40 And when he had said this, he showed them his hands and his feet. 41 And while they still disbelieved for joy and were marveling, he said to them, “Have you anything here to eat?” 42 They gave him a piece of broiled fish, and he took it and ate before them. According to what Jesus had told his disciples (Luke 24:49, “And behold, I am sending the promise of my Father upon you. But stay in the city until you are clothed with power from on high”) and what Peter said later (Acts 2:38 “Repent and be baptized every one of you in the name of Jesus Christ for the forgiveness of your sins, and you will receive the gift of the Holy Spirit. ), the Spirit was working in a new manner, that is, in a way that he had not worked previously but in a way that had been promised or prophesied. No other psalm is so frequently quoted in the New Testament, which acts as a good indicator of the importance of the event. And because the disciples had struggled with the concept of Jesus’ death, he told them plainly that he was going back to the Father. We conclude today’s message with a better understanding as the significance of the upper room as the location for the events of the teaching by our Lord by washing of the disciple’s feet, Jesus’ instruction to the disciples with regard to the elements of the Last Supper, the appearance of the Lord after the resurrection, the disciples’ selection of Matthias to replace the deceased Judas, the place where the God’s gift of the Holy Spirit comes upon the men and women believers who prayed and waited there, and the location where Peter, having received the Spirit delivers the first sermon, and the place where 3,000 hear the Spirit-filled receive Christ as Lord and Saviour and are baptised in the Spirit. And with the Ascension of Jesus, we see the passing not only the ministry to the body of believers, baptised with God’s power and comfort through the Holy Spirit.